I love headphones. I love great sounding headphones that are both a comfort to wear and reproduce sound in a natural way. Not all headphones are created equally, of course, and sometimes you do get what you pay for. And sometimes, no matter how great something sounds, there is just no way you can justify paying that much money for headphones. But for me, if I have the money, and the audio quality and comfort is there, well, I am always a sucker for a great pair. Last time around, I reviewed the Sennheiser HD 650‘s, which became my (then) favorite all-time headphones. Yes, of all time! A few tears actually fell as I boxed them up and shipped them back once my review period was over. But onward and upwards, I always say! It’s time to try out some new headphones! Now, as an audiophile, the chances of my actually buying these headphone after having seen them in a store would be next to zero. While the idea of a pair of headphones that can also transform into a pair of speakers sounds interesting, experience has taught me that gimmicks of this sort usually do not translate into great sounding headphones. And the iHome iHMP5’s prove that out. While it is nifty to be able to take off your headphones and turn them into speakers, the end result is sub-par audio quality. Honestly, for a pair of headphones that only cost $69.99, the audio quality is probably middle of the road, with a prevailing curve to the low-end. 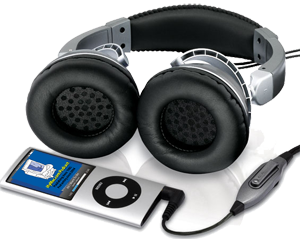 Shriek-y highs and muddy bass for compressed audio (MP3s) are the norm when playing on the iHome headphones. CD quality audio fares better, but still not good enough that I could recommend to anyone based on headphone use only. Comfort in headphone mode is a little cumbersome. They just were not all that comfortable. I could use them for, at most, an hour before I would have to take them off to give my head and ears a break. But then there is the whole speaker-transformer thing. Granted, the audio playback via the speaker mode is twice as bad as it is in headphone mode, there is a nugget of a good idea here. My wife, for instance, speculated that she would like this feature so that, if she wanted someone else to hear a song and they were not comfortable simply donning her headphones, this would come in handy. To turn the headphones into speakers, you flip the ear pieces around and connect two magnetic proximity connections together. (A red light comes on when done correctly.) At that point, the batteries (2 AAA) located in the left earphone kick on the small amplifier, and audio is clearly heard as if a small pair of speakers were playing. Again, the audio quality in this setting is, honestly, atrocious. But the gimmick idea itself is not, and I don’t remember ever seeing this done before. I give iHome points for a creative idea alone, if not for the actual execution. They work as advertised. You clearly hear music. As a podcaster, of course, I tried out spoken word content via the speaker mode, and found the audio passable if not inspiring. I could listen to podcasts like this, if I had nothing else, but I would not want to. MyMac.com rating: 1 out of 5 in speaker mode, and eking out a 2 out of 5 for headphones. I have to admit, I have a soft-spot in my heart for Audio-Technica. Long before I was the Mac publisher and podcaster that I am today, I was huge into audio equipment, dating back to the mid-1980s. Back when CDs were still just around the corner, and serious audiophiles had expensive record collections to play on a top-quality turntable. And for me, that turntable was an Audio-Technica. While I forget the details on what model it was, I loved that turntable. At a list price of $219.99, the QuietPoint’s are the second most expensive headphones in this review. They use active circuitry to cancel ambient noise, such as those on an aircraft or loud conversations going on behind you at work. To do this, you have to install a single AAA battery in the right earphone. Fear not, you won’t start tilting your head in that direction because of the added weight. I didn’t even notice it. The included audio cable that connects to the jack in your iPod/iPhone/receiver is very, very short. For these types of headphones, I can’t remember ever having such a short cable: 42″. Now that may not sound short, but I assure you it is. If you have these plugged in to your computer, and turn around quickly, you are liable to rip the headphones right off your ears. (Says the voice of experience.) The cable also detaches from the headphones themselves, so you could conceivably replace them with a longer cord. But why should you have to? And why did Audio-Technica make the cable so short? The cable is also very thin and prone to crimping. But wait, what’s this still in the case? Another, longer cable? Yes, a 60″ cable is also included! I am saved! Now here is where Audio-Technica makes good. Because the longer cable is what I want when sitting in front of the computer listening to music, I don’t need, nor want, such a long cable if I am on an airplane and my iPhone is sitting in my pocket or lap. On a recent trip to Utah (via Las Vegas) I brought a paid of headphones with a very long cable. It was a pain to manage such a long cable, and it kept getting in the way. The headphones themselves feel decently comfortable on your head, but there really is not enough padding at the top. Still, I would have to be wearing them for more than a couple hours before I really started to notice. The crux of any headphone review, however, is audio quality. Because the QuietPoint’s is active noise cancellation, you have to turn it on, or these headphones simply sound awful. I have had other noise-cancelling headphones in the past that did not degrade the sound this badly when the battery dies on you. When the noise-cancelling is active and everything is optimal, the QuietPoint’s sound quite nice. Nothing spectacular, however, and therein lies the problem. These headphones list for $220, and at that price-point, I really do expect better sound quality. Bass is decent, but nothing that will knock your socks off. Midrange is good, not a lot to complain about. And highs are good, unless played at higher volume, at which point they tend to get shriek. Bass, as well, starts to distort and drop off at high volume. The QuietPoints also bleed sound at an unacceptable level. What good are headphones if your wife keeps giving you dirty looks while you are wearing them while she is trying to watch television on the same couch? “I can hear that,” she kept saying. And she could, quite clearly. Not good. 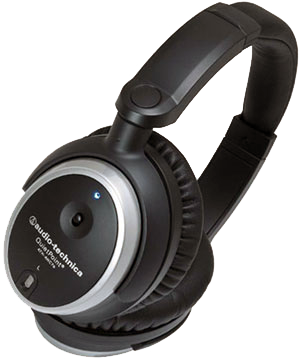 After reading other reviews online for the Audio-Technica noise-cancelling QuietPoint ATH-ANC7b, I was frankly expecting much better. If you plan on spending this much money on headphones, continue reading. MyMac.com rating: 3 out of 5. I actually did not have the Shure headphones when I first started evaluating headphones for this article. When they arrived, I originally thought I would simply save them for a separate review. Then I started using them. 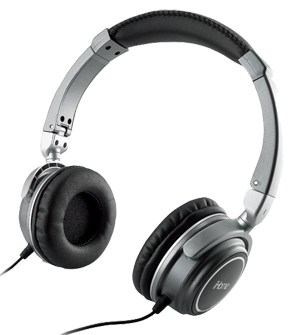 And what I discovered is a pair of headphones that rival much more expensive headphones (see the AKGs below) and blows away the Audio-Technica QuietPoint handily, and for $20 less! There is no fancy noise-cancelling trickery employed here. The headphone cups just naturally close out ambient noise (to a point) and the audio quality… well, we will get to that in a moment. The cable is detachable, and is very long with a twisted middle for even longer range. 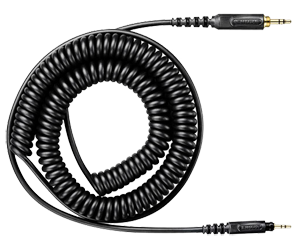 Because these are monitoring headphones, aimed at musicians and technicians, you have to have exceptional length and flexibility. The SRH840’s deliver on both accounts. Okay, let’s get to the meat of the issue: the audio reproduction of the SRH840’s is exceptional. Bass is solid and punchy, never bottoming out even at extremely loud volume. (The kind that induces hearing loss with prolonged exposure.) The mid sat right where it should be with every type of music I could throw at them. The high was crisp and clean, like a bird chirping in a tree at the first hint of springs sunshine. The difference between the Shure’s and the above Audio-Technica headphones are night and day. It’s like going from a decent iMac G4 to an MacPro. It’s real, it’s clear, and there is no going back once you experience the difference. 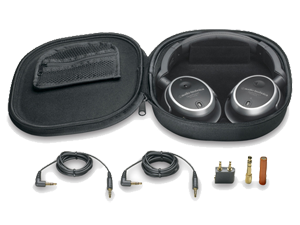 True, these are not the headphones you will want to lug around in your carry-on at the airport, but only because they are large and heavy. But you will want to. The soundstage produced by the Shure SRH840’s are matched only by the AKGs. They are wonderful in almost every respect. Want bliss, of the audio variety? Sit back, relax, and put on the song “Trouble by Coldplay” while playing them on your AKG K 272 HD’s. Seriously. This is the sound you never knew you were missing until you hear it. 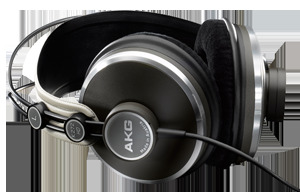 The AKG K 272 HD feature an ultra-soft velvet ear-pads and gimbal-suspended headband. Yeah, velvet. And almost perfect adjustments for any person. No expense, it seems, was spared by AKG to make these some of the finest headphones in the world. These are the headphones that have displaced the Sennheiser HD 650’s I mentioned at the beginning of this article, and yet they are $250 less expensive. They are exceptional in every single facet, from comfort to sound. These headphones are in a very small, select class of audio products. And while I have not tested every single pair of headphones on the planet, I can honestly say that the AKG K 272 HD’s will give them a run for their money. What else can I say about Bass, Treble, etc… that you can’t grasp from the above three paragraphs? So we come down to a direct comparison between the AKG and Shure products. I gave them both a perfect 5 out of 5, so which do I prefer? Well, it depends. And while that may sound like a cop out, it’s really not. They both sound fantastic, reproducing audio unmatched by most other headphones. So it comes down to, for me, the type of music you are listening to. For harder music, such as dance or rock, I think the Shure SRH840’s are a better fit. They just play louder. They get up in your face, smack you around a little bit to make sure you are paying attention, then feeds your need to rock out without compromise. 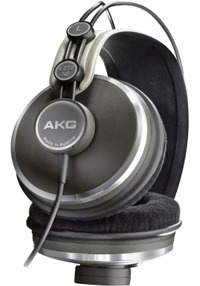 The AKG K 272 HD’s are more respectable to you. Kenny G, the soundtrack to Star Wars, or some soft rock. The AKGs will politely ask if you would like red or white wine with your meal, then deliver such an exceptional experience that you will drift, blissfully, off to sleep with a smile on your face. They are slightly coy, understated, and unpretentious, yet refined like a rare gem. 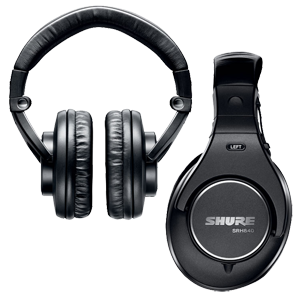 They are what the SRH840’s aspire to be, but the Shure product is just having too much fun rocking out and watching the SuperBowl to care.